A MCL injury can be very painful and is caused by a valgus stress to a slightly bent knee, often when landing, bending or on high impact. It may be difficult to apply pressure on the injured leg for at least a few days. Treatment of a partial tear or stretch injury is usually conservative. Sports medicine therapists should be a first choice option for diagnosis and treatment of injuries to this structure. This includes measures to control inflammation as well as bracing. Kannus has shown good clinical results with conservative care of grade II sprains, but poor results in grade III sprains. As a result, more severe grade III and IV injuries to the MCL that lead to ongoing instability may require arthroscopic surgery. However, the medical literature considers surgery for most MCL injuries to be controversial. Isolated MCL sprains are common. ^ Kannus, P (1988). "Long-term results of conservatively treated medial collateral ligament injuries of the knee joint". Clinical Orthopaedics and Related Research (226): 103–12. doi:10.1097/00003086-198801000-00015. PMID 3335084. ^ Indelicato, P. A. (1995). 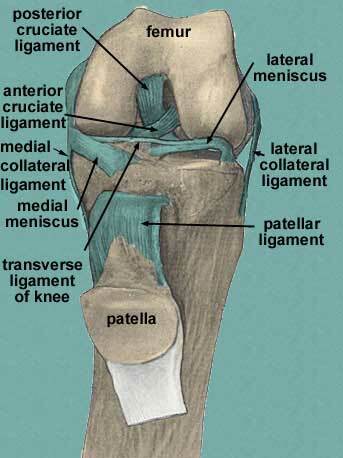 "Isolated Medial Collateral Ligament Injuries in the Knee". The Journal of the American Academy of Orthopaedic Surgeons. 3 (1): 9–14. doi:10.5435/00124635-199501000-00002. PMID 10790648. ^ Reeves, K. D.; Hassanein, K (2000). "Randomized prospective double-blind placebo-controlled study of dextrose prolotherapy for knee osteoarthritis with or without ACL laxity". Alternative Therapies in Health and Medicine. 6 (2): 68–74, 77–80. PMID 10710805. [unreliable medical source?] Results should be contrasted with meta-analysis such as the one by Rabago et al: Rabago, D; Best, T. M.; Beamsley, M; Patterson, J (2005). "A systematic review of prolotherapy for chronic musculoskeletal pain". Clinical Journal of Sport Medicine. 15 (5): 376–80. doi:10.1097/01.jsm.0000173268.05318.a4. PMID 16162983. Lay summary – PubMed Health (April 30, 2007). ^ Fan, Hongbin; Liu, Haifeng; Wong, Eugene J.W. ; Toh, Siew L.; Goh, James C.H. (2008). "In vivo study of anterior cruciate ligament regeneration using mesenchymal stem cells and silk scaffold". Biomaterials. 29 (23): 3324–37. doi:10.1016/j.biomaterials.2008.04.012. PMID 18462787.